I tend to get bored very easily. That’s why I write on a wide variety of topics for a wide range of audiences. I am an award-winning magazine editor. I absolutely love what magazines offer. But I also write novels for young adults. 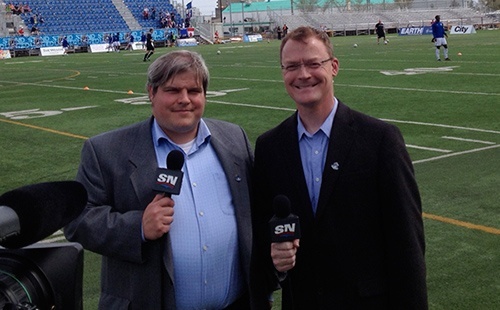 I’m also a broadcaster, who provides colour for FC Edmonton games. I’m a former newspaper guy, and loved the fast-pace of the newsroom. I’ve also edited an alternative weekly in Edmonton, edited the official magazine of the Edmonton Oilers and Kickstarted an app-based Canadian soccer magazine, called Plastic Pitch. Avenue Edmonton was named Alberta’s magazine of the year in 2015. As the editor of that mag, I’m more proud of that than the editor-of-the-year award I got that same year. My wife and I have two wonderful kids. I like it very loud and busy when I write — being on some retreat looking at a lake would be the WORST. I like to write with really fast, loud music in my ears. That is what years of writing about music and sports will do to you. Welcome to the website. If you want to contact me, click on this link stevensandor@rogers.com. Was a nominee for the 2012 provincial editor of the year award for my work with Avenue. Playing For Keeps, was listed as one of the year’s best for fiction Grades 7-12. Avenue Edmonton is one of three finalists for the provincial distinction as Alberta’s top magazine. My feature on the Comrie family, “Growing Up Comrie” was nominated for an AMPA award for profile writing. I was selected as the province’s 2015 magazine editor of the year for my work with Avenue Edmonton. For the second year in a row, Avenue Edmonton was one of three magazines shortlisted for AMPA’s Magazine of the Year award. This year, the judges voted the magazine the best in the province. I edited the magazine throughout 2014, which was the year of publication considered for the award. For the third year in a row, Avenue Edmonton has been named one of the three finalists for the Magazine of the Year award. I’ve been the editor of Avenue since 2010. Our FC Edmonton game production team was nominated for an award as the best sports live event broadcast in the province of Alberta. That game was the August 2, 2015 NASL match between FC Edmonton and the Ottawa Fury held in Fort McMurray.